Have you ever envisioned a honeymoon so romantic that you would want to take a honeymoon almost every other year? Well, the honeymoon in India is getting so innovative that one requires a Herculean effort to say no to them. Given the fact that these packages are being priced and packaged deliciously, one does not really have a valid reason to refuse them. The latest trend and mantra for romantic couples is to romance on a houseboat. 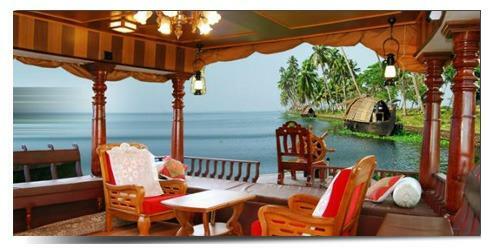 When one thinks of houseboat honeymoon, the first name that leaps across the brain is that of Kerala. Kerala is one of the top places to see in India. Kerala has several shades to it. Its profile comprises of greenery, wildlife, hills, tea estates, rivers, lagoons, seas and almost every good thing which one can visualize. Yet when we talk of romance, it is the houseboat which takes the crown. Interestingly, the houseboat business is a major part of Kerala tourism. Houseboats are rented not just for a small voyage lasting around an hour, but also for one full day or one full week. So, the opportunity to spend your entire honeymoon on a houseboat sailing lazily over the tranquil waters of Alleppey is there to be seized! The rent of the houseboats varies since they are available in different shapes and with varying amounts of luxury. A luxury houseboat will cost you higher, but it will be all decked up like a suite from within and grant you the privacy you seek. Peeking through the windows of your room with your spouse beside you can be romantic, and more so if it is night time with all the stars shining down over you two! Another hot destination for a houseboat honeymoon is Kashmir. Kashmir too clearly makes it to the top places to see in India. It is a typical mountainside destination whose valleys presents such a beautiful sight that you will be truly bamboozled. The Dal Lake is the icing on the cake and a houseboat journey across it can be very romantic. Most honeymoon packages in India heading to Kashmir include Dal Lake where a sunset-tinged houseboat journey can be an extremely memorable affair. One more place which does not get much credit and is fairly unpopular is the city of Kolkata. Its Hooghly River sees some lovely house boats being ferried by crotchety old boatmen, with two young couples enjoying the cool slap of the evening breeze.